Oct. 12, 2013 9:00 a.m. 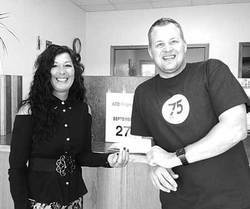 In conjunction with the first ATB Financial Branch opening 75 years ago in Rocky Mountain House, ATB Financial Agency Millet held a celebration on Friday, September 27. Across Alberta, in 301 ATB communities, a whopping $236,000 is being distributed to a variety of charities. In Millet, Agency owner Craig Rudolph presented Marie Schneider (below) of the Millet Food Bank with a donation of $500. The Millet Food Bank helps 10-15 people weekly and coming into Christmas the demand for food will be even higher. They are open Tuesdays and Fridays 10- noon and can be reached at (780) 387-0227 or at milletfoodbank@gmail.com. Once again, thank you for being a part of this special occasion. ATB is so proud to be Albertan, serve Albertans, and be a part of so many communities throughout the province. Millet ATB Agency hopes to continue serving Millet for another 75 years and more! Thank you.